Boil macaroni as per the instructions on the packet. Take a pan and add 3 glass of water. Add all chopped vegetables in it and boil it for about 3-4 minutes. Pour it in the colander and let the water drain. Don't overcook it. Take kadai (wok) and heat 1 teaspoon of butter. Saute all the vegetables for 2-3 minutes. Don’t overcook it. Keep it aside. Take kadai (wok) and heat butter. Add all purpose flour (maida) and sauté till it turns slightly brown. Add milk and stir continuously to avoid lumps. It will be of a thick consistency. Add ½ cheese into it and let it simmer for 2-3 minutes. Add salt, pepper and capsicum. Mix all the vegetables and macaroni in these white sauce. 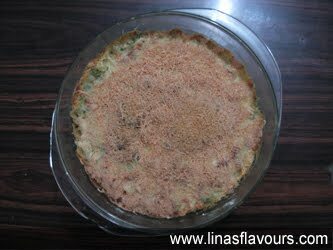 If you want to make different layers then divide white sauce into two parts and mix vegetables in one part and macaroni in other. Take a microwave bowl. Apply butter in the bowl and sprinkle maida. Add vegetables, make second layer of macaroni and again vegetables on the top. Sprinkle remaining cheese and put it in the microwave for 10 minutes to grill it.